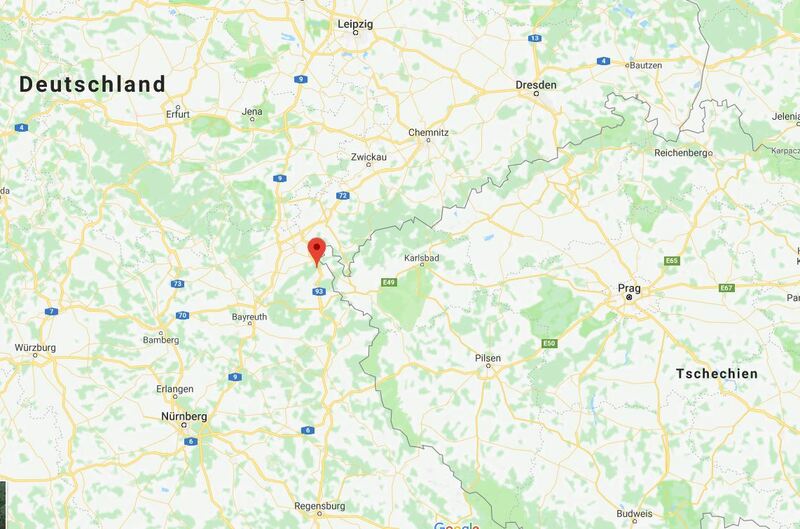 Ah – I see – the roots of Rosenthal and Hutschenreuther are in Oberfranken! Always I have admired German porcelain. Not just Meissen, but also Rosenthal or Hutschenreuther. But I never thought about where the latter brands come from. I found out, when stopping over in Oberfranken. 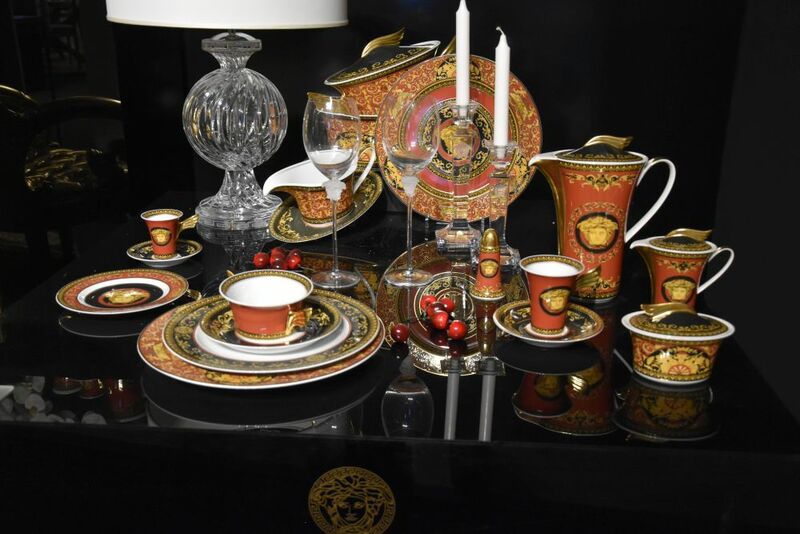 The family Hutschenreuther started producing porcelain in 1814. It was a love story, as Carolus M. Hutschenreuther married the daughter of the forest ranger. The ranger knew where to find the raw material for porcelain, caolin (or “white earth”). 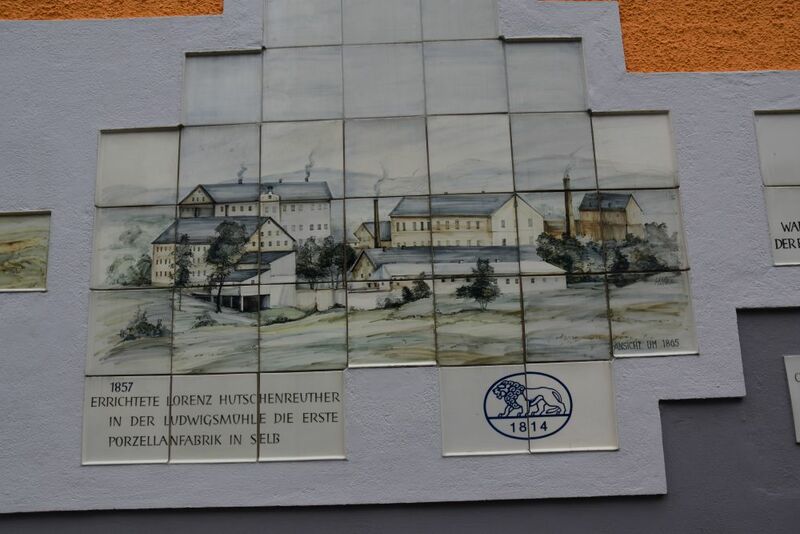 In 1857 Carolus’ son Lorenz founded his own porcelain factory in Selb, as this panel shows. Around 1900, the family Rosenthal settled in Oberfranken and the brand “Rosenthal” emerged. In the 1950s, junior Philip Rosenthal returned and initiated the beautiful “studio-line” that well-known arists like Walter Gropius contributed to. 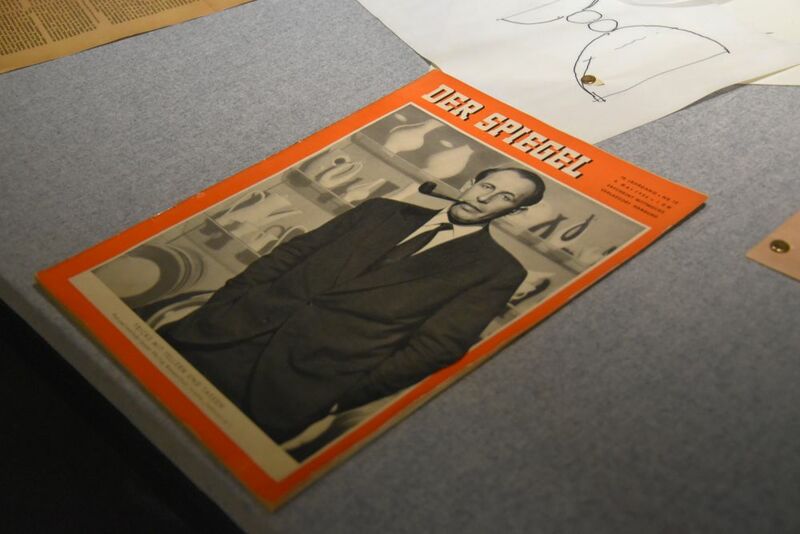 In 1956 the journal “Der Spiegel” had him on their front page and wrote about him. Today, Rosenthal and Hutschenreuther belong to the Italian Sambonet-Paderno group. In June 2018, I am on the road again, with Vreni. Our target is Berlin, and about half way to Berlin lies Schönwald. Our friend Herbert, now retired, has returned to his hometown in Oberfranken. We look forward to seeing him and envisage a hike in the Fichtelgebirge, as we have hiked together so many times in the Swiss Alps. We expected that there is nothing else to do in this peripheral region of Germany, near the border with the Czech Republic. A few kilometers before reaching Schönwald, we stop at a gasoline station. 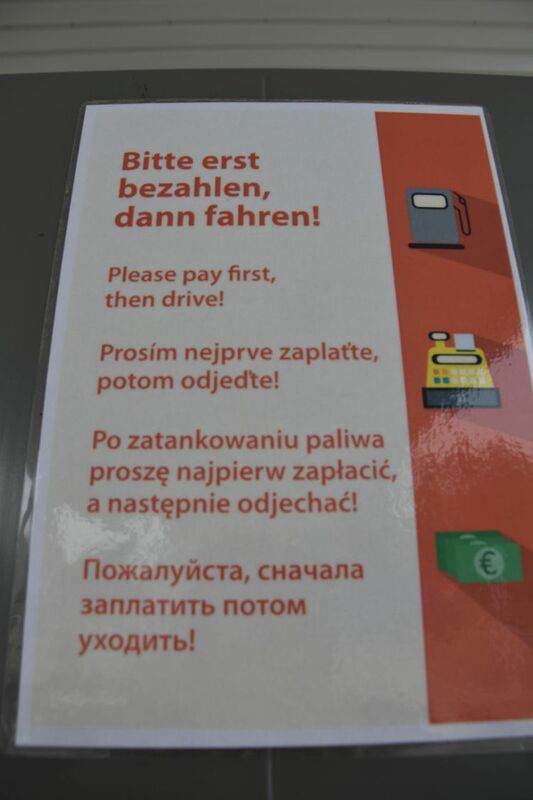 The order to “pay first, then drive” is written in German, English, Czech, Polish and Russian. This confirms that we are now very, very close to people with a slavic background. When leaving the motorway at Selb to reach Schönwald, we have to drive our car around a huge teapot. A teapot? Do they make teapots here? Yes! Schönwald, Selb and more cities in Oberfranken built innovative factories using mechanisation in the 19th century and produced more than 90% of German porcelain. 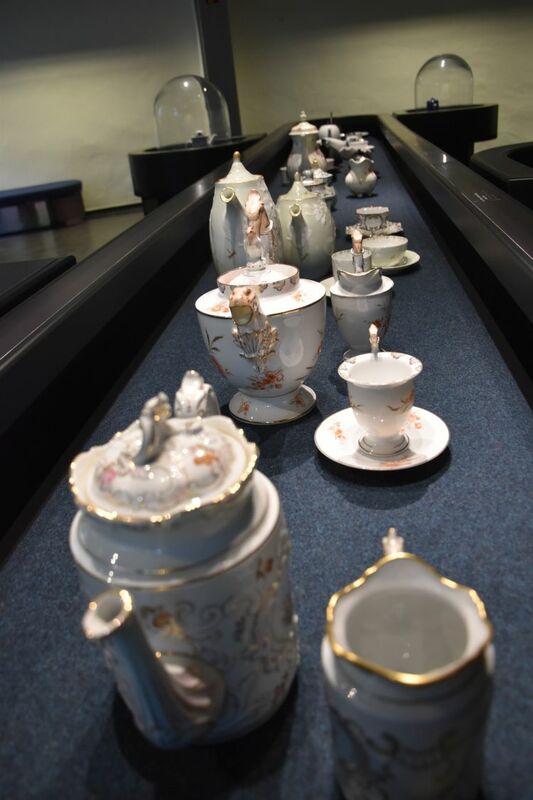 Today, they offer a culture tour (Kulturreise) on the tracks of porcelain in Oberfranken. We plan for a museum day to explore porcelain. Hiking is no fun anyway, because it is raining heaviliy and in the mist we cannot see any of the peaks of the Fichtelgebirge, though Herbert points into their direction and names some of them. Hm, we see nothing but white clouds. We have our first dinner in a small hotel at Schönwald. Herbert turns round the plate and shows proudly that it carries the label “Schönwald”. 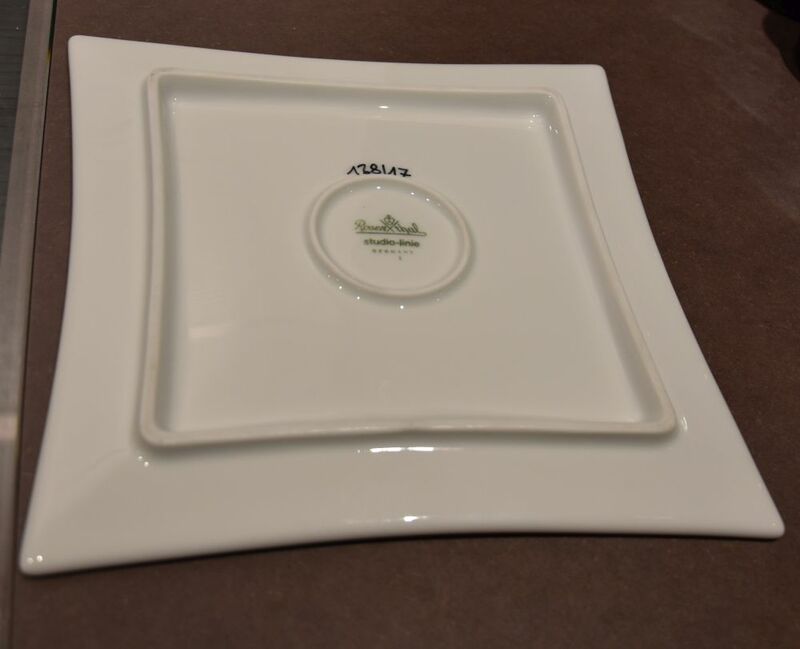 Yes, Schönwald has its own factory and label for award winning robust hotel porcelain. 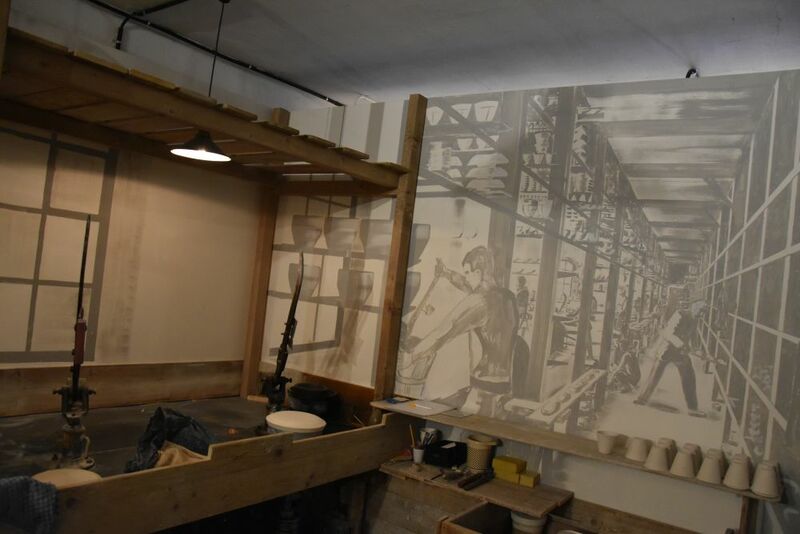 The city of Selb has opened one of their old porcelain factories under the label Porzellanikon. 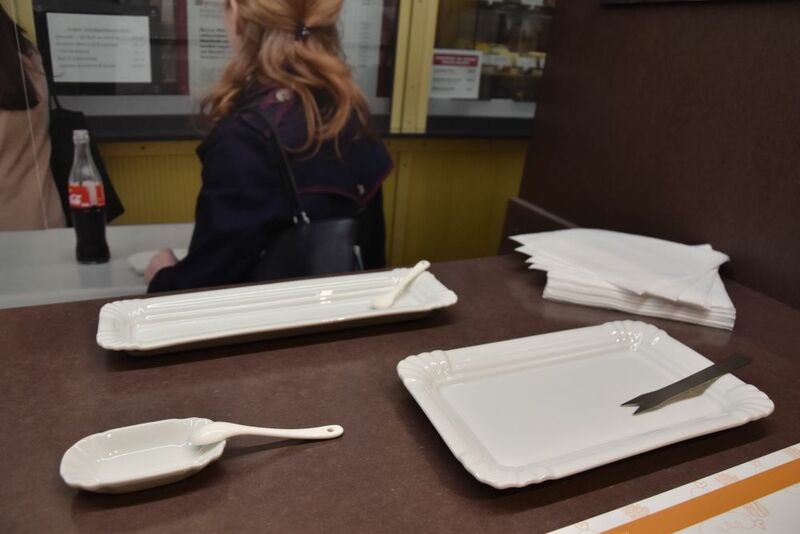 Visitors can explore the production of porcelain and enjoy the beauty of the tableware of Hutschenreuther, Rosenthal, Kahla or Villeroy & Boch, all connected up today. Here is what I took with me – it may not be perfect, as I am not a porcelain specialist at all. 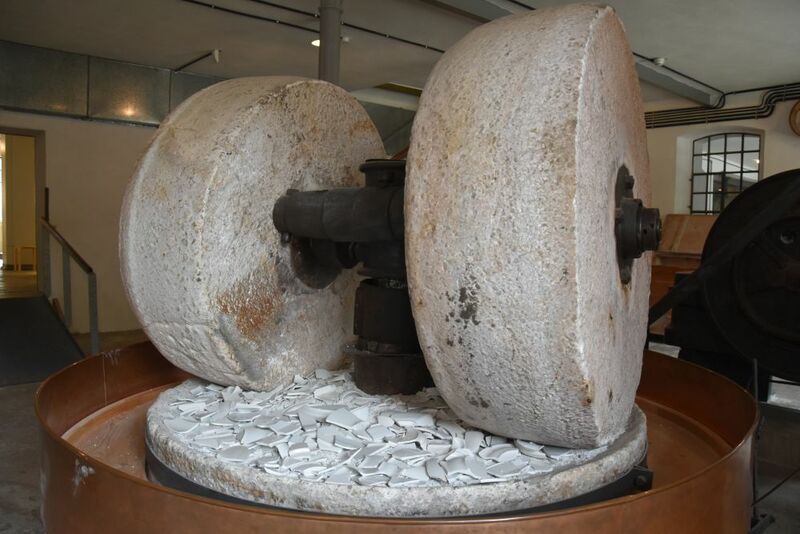 The production of porcelain starts with blocks of stone that have to be crushed in several consecutive steps, a process that starts with huge millstones. Using rotary drums, the stone blocks are further crushed. Kaolin, quartz and feldspar and other components are then mixed with water. The water has to be pressed out again using filters. 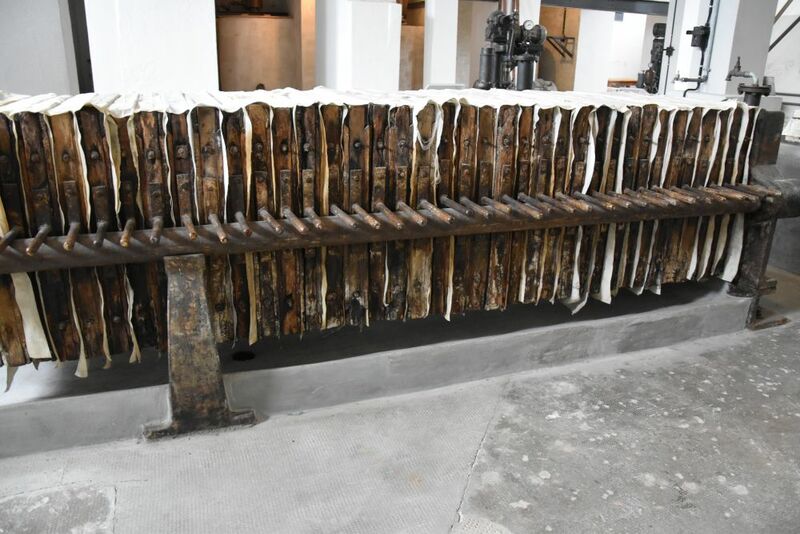 The raw material to produce plates, platters or plain bowls looks like over-sized sausages. They are then formed using presses. Our friend Herbert worked here as a teenager to gain some pocket money. 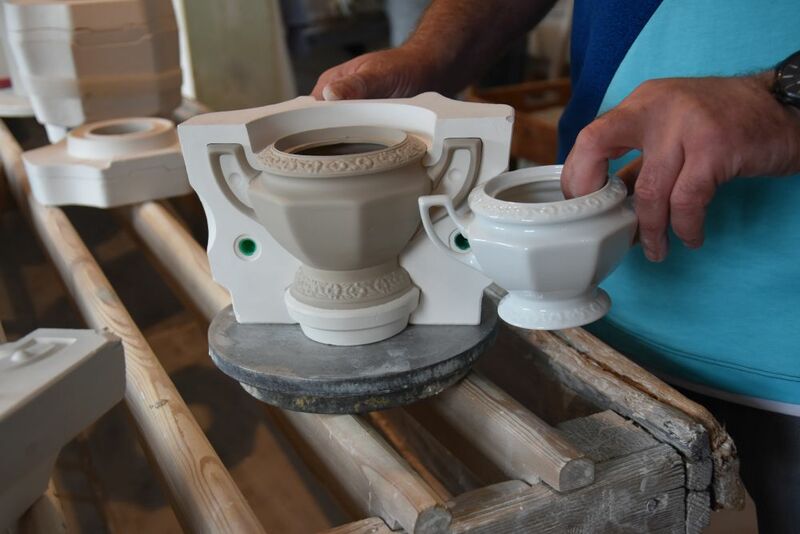 For more complicated vessels such as this sugar bowl, liquid raw material is casted into a plaster mold. The sugar bowl forms itself near the plaster and when thick enough, the liquid in the middle is poured out and the bowl remains inside. I can hardly believe that this works. 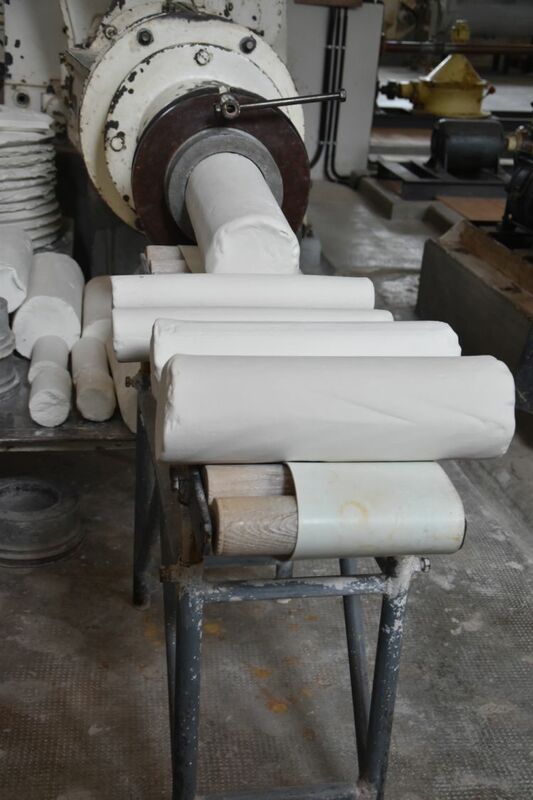 The modeled porcelain pieces are then baked at high temperatures – the factory disposes of old kilns that we can walk into. As the photo above shows, the size of the sugar bowl is reduced considerably after having been baked. 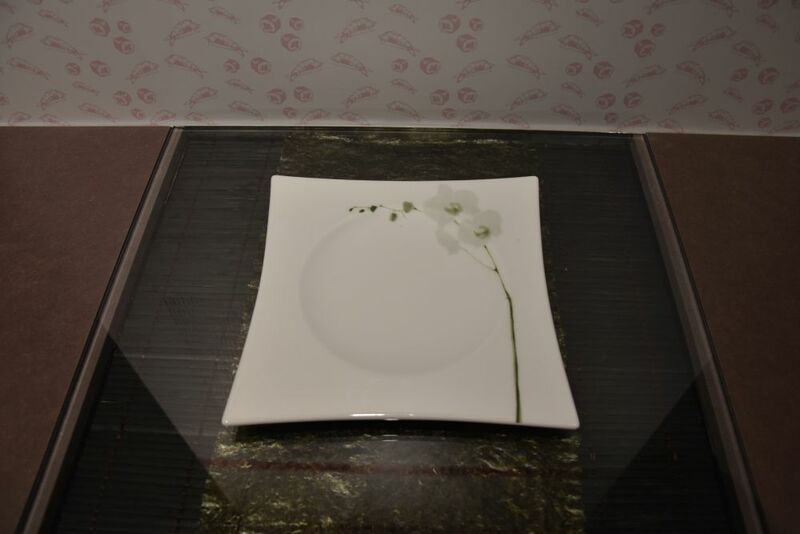 It is a real pleasure to look at the well designed pieces of porcelain in the exhibition of the Porzellanikon. Here is a plate from the studo-line of Rosenthal. And yes, it is Rosenthal. Actually the people from this area have this habit of turning round the plates in restaurants. These two sets would make elegant coffee or tea tables. The factories were inventive and even made cardboard plates out of porcelain. I do love this design for children – the humor in it makes me smile. We end the day with a walk through the small town of Selb. 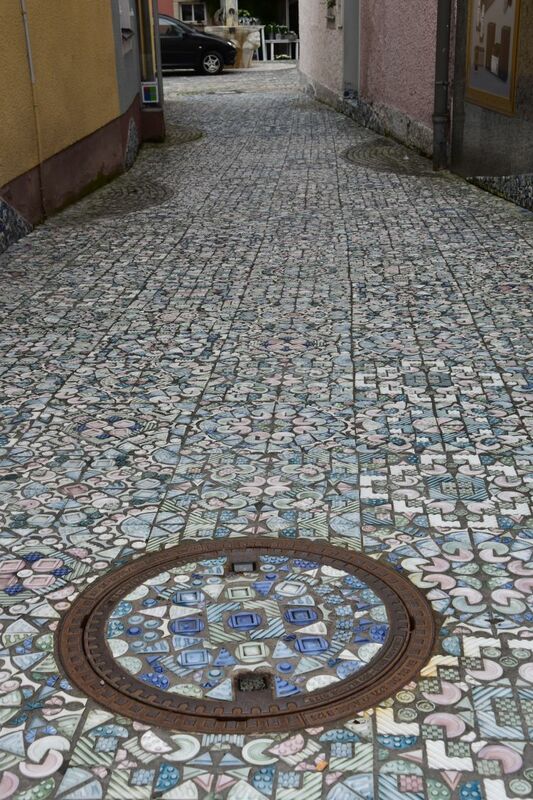 They cherish their porcelain tradition with the unique porcelain street. 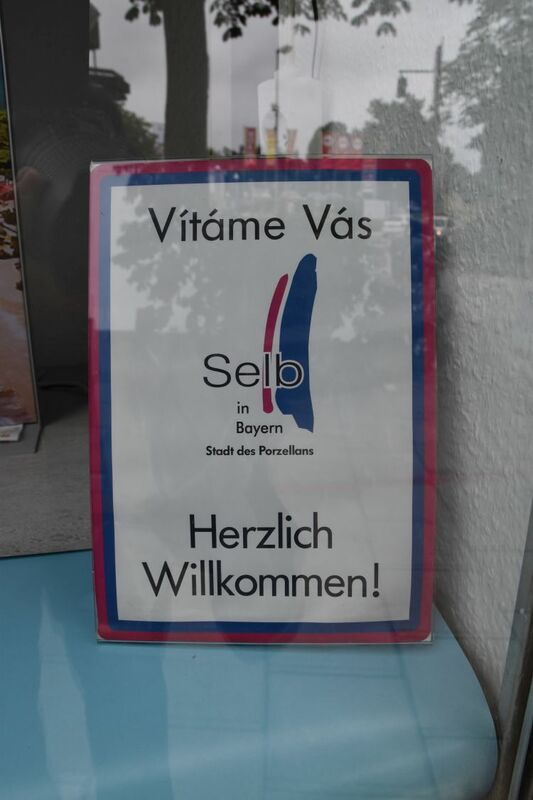 And again we find a slavic announcement – the small town of Selb wishes a “hearty welcome” in German and in Czech: Welcome to the town of porcelain in Bavaria. Yes, thank you, Selb, Schönwald and Oberfranken. We felt welcome both, when meeting Herbert and when learning about porcelain. 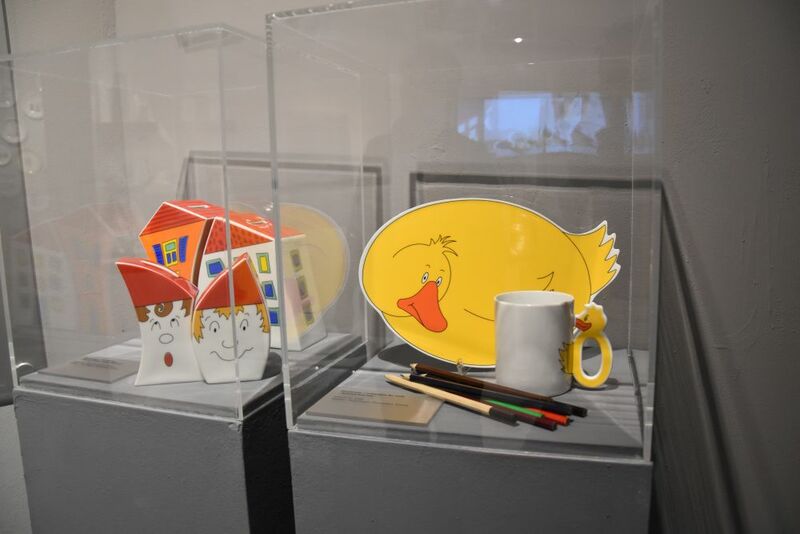 This experience was worth the stop over on our way to Berlin and we may return one day to see Herbert again and to explore more of the German porcelain culture.